There's nothing cosier than curling up in a well-worn leather armchair. Ranging from contemporary to classic designs, Brosa offers a wide selection in every shape and size, making sure there is a leather armchair style for you! Whether you are after a leather armchair for the living room, bedroom or office, take your pick from a great range of pieces. Available in every shade from Pewter Grey to Oxblood Red to Walnut Brown, each leather armchair has a rustic look, with its own unique markings and character. 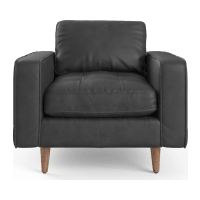 Brosa uses premium 100% pure leather, so you can be assured that the quality of your leather armchair is second to none and will stand the test of time. Discover for yourself how incredibly comfortable our leather armchairs are. Each is filled with just the right amount of cushioning and the leather is designed to only grow softer and improve with age. The design is timeless and easy to match with your living room furniture. Style your leather armchair as part of a complete leather furniture set, or on its own as an accent piece.